Embed a Questionmark Perception survey or quiz inside MindTouch. 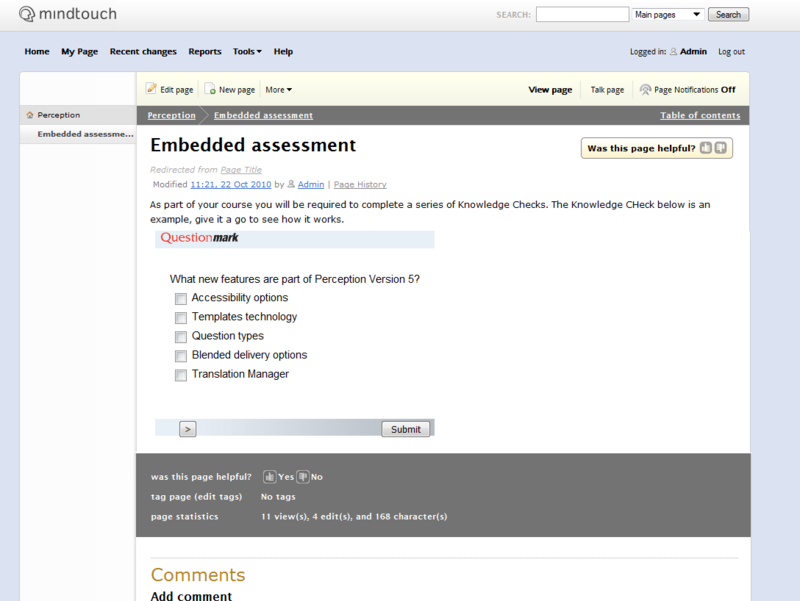 To see how this would look, view a snapshot of an assessment embedded within MindTouch page. MindTouch is an open source enterprise documentation platform used by enterprises or for enterprise collaboration and as a wiki platform. It is also used for rapidly developing social business applications. To embed a Perception assessment within a MindTouch page you will need to embed your assessment in an IFrame using an html code. Using DekiScript, the MindTouch built-in scripting language, would allow a site admin to govern who can add tests (with more granularity) and would provide a much more robust mechanism for exposing Questionmark than an iFrame. MindTouch has 20+ Million users and this is a commonly requested capability. Does QuestionMark have a web API? With MindTouch one can create an extension very quickly that would expose an external web-service API potentially adding programmatic access to QM tests and data.